Our hotel is located on the “Camino de Santiago” Way of Sant James; French traditional and historic route linking León and Astorga through the localities of the Camino (Virgen del Camino, San Miguel del Camino), Villadangos del Paramo, San Martin del Camino, Hospital de Órbigo, San Justo de la Vega and Astorga. The pilgrims can pause at our hotel to a deserved rest after the journey that brings them to Leon, and before heading to the city of Astorga. León, monumental city: Born as Roman military camp of the Legio VI Victrix to 29 a. C.. The monuments and various celebrations in the year (“Semana santa”, the festival of San Juan and San Pedro, San Froilán holding), make receiving national and international tourism. Places of interest are: the Cathedral, the Basilica of San Isidoro, Parador of San Marcos, building Botines, all declared of Cultural Interest and the MUSAC (Museum of Contemporary Art of Castilla and León). Astorga, age-old city: Noteworthy in this city of Roman origin, monuments and historic buildings of great value; with the peculiarity of being made in different historical periods. Chronologically we could mention the different Roman routes, the cathedral and the Episcopal palace designed by Gaudí. Is Remarkable the visit to the Church of Villadangos del Páramo dedicated to St. James, patron of the Ville. A temple of latin cross from the late seventeenth or early eighteenth century. 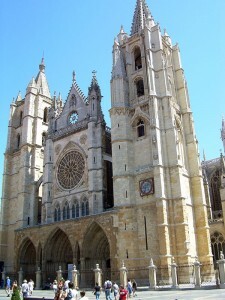 The Basilica of the Virgen del Camino, located six km from León, where we see continued devotion to the Virgen del Camino, mainly among the people of the León region and neighboring areas. The present basilica was inaugurated on September 5, 1961. In the town of Hospital de Órbigo stands the Bridge of “Paso honroso”. Don Suero defended the pass over the bridge more than 5 centuries ago. In Bañeza we can visit the Museum of Jewellery in the Silver Way and Interpretation Center of Land of “la Bañeza”, completing a varied and interesting museums offer. Hotel Avenida III offers all pilgrims a restful stay after a long stage with friendly service, traditional food and all the facilities you might need. We have a gym and sauna for a total rest and recover strength for the next stage. We have special prices for pilgrims, do not hesitate and book your room with us.